Analysis Toshiba is looking to boosted flash and disk capacities to grow storage revenues and help returned the troubled company to growth. In a July 6 in-house presentation investor relations briefing by Yasuo Naruke, President and CEO of Toshiba’s Storage and Electronic Devices Solutions Company, information was revealed about Tosh’s SSD and disk drive strategy. The slide deck talks about flash first and disks second. WE’ll do the reverse because the disk part is simpler while the 3D NAND part is both more detailed and, to us, more interesting. The big news us that Toshiba has been the sole disk drive maker not using helium-filled drive technology to increase the platter count and hence the drive’s capacity. WDC’s HGST acquisition led the way with Seagate recently following suit with a 10TB drive. With performance disk drives being replaced by SSDS the only HDD markets with growth are nearline and bulk capacity drives. Toshiba’s highest capacity drive is at the 8TB level. This means its market focus is on nearline drives and not high-capacity drives. It has a 10TB drive coming in 2017 with 14TB and 16TB drives scheduled for 1018. 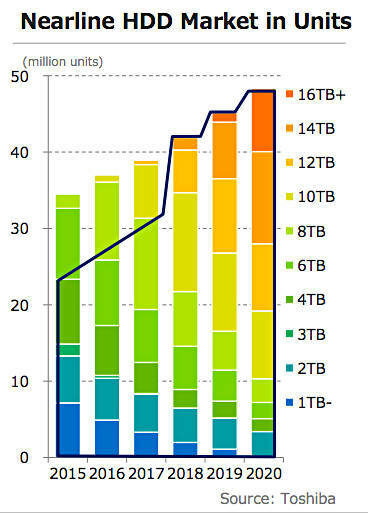 A Toshiba chart shows 16TB+ drives appearing in 2019. Toshiba sees recording technology improvements further increasing capacity out to 2021 with the bit cost of SATA read-intensive SSD enterprise SSDS not crossing below nearline disk drive cost until 2023. After helium drive entry in 2018, it foresees TDMR (two-dimensional magnetic recording) arriving in 2019, MAMR or HAMR (micro-assisted or heat-assisted magnetic recording) in 2020. After that cheaper read-intensive enterprise SSDs will start replacing nearline disk drives. The NAND story is pushing 3D capacity through more layering and pumping up 3D NAND fab capacity. It sees itself shipping NVMe/PCIE SSDs and enterprise data centre SAS and SATA SSDs plus client NVME/PCIe and SATA SSDs. Data centre SSD demand will increase, with a 14 per cent CAGR from calendar 2015 to 2019, and there will be a general SSD market expansion based on eroding flash prices. The key to that is increasing bits per SSD wafer and that depends on moving from 2D or planar NAND to 3D NAND dice and getting a good yield from each wafer. Its 48-layer BiCS 2 (Bit Cost Scalable gen 2) technology, now in mass production, provides 256Gbit (32GB and TLC) chips, but Samsung leads the 3D NAND market and Tosh, with fab partner WDC/SanDisk has to catch up. It will accelerate BiCS development and production to meet the expanding demand and stay price-competitive. BiCS 3 is likely to be 64-layer and TLC, or, Stifel Niklaus MD Aaron Rakers suggests, a die shrink. It will be sampling by September this year, with a future BiCS (gen 4 we assume) likely to pass past 100 layers. The majority of Toshiba’s flash production should be 3D NAND in its fiscal 2018 year. It will spend 860 Bn yen in the fy2016-fy2018 period to achieve this, with WDC chipping in cash. The Yokkaichi plants will use Big Data collection and analytics to improve their efficiency. Manufacturing and test equipment will generate an anticipated 1.6 billion data points a day for the analytic routines, with machine learning techniques applied to improve the analysis. For example analysis of product images and test results can be automated to speed and improve decision making. There will be a next-generation SAS SSD in the first 2017 quarter (fiscal we assume) with better sequential read/write bandwidth than the competition and lower power consumption. A next-generation PCIe SSD will be available then as well, with greater capacity than the competition as well as lower power consumption and better sequential read/write performance. NAND cell technology will use pseudo MLC (MLC -2bits/cell) flash which is said to operate as fast as SLC (1bit/cell) flash). We understand this provides enterprise MLC endurance and retention characteristics but with only half of the density of MLC, as cells are used for over-provisioning. There will be support for 24Gbit/s SAS and multi-link PCIe gen 4. Toshiba is also looking at host control of SSDs for better performance management and reliability. It reckons it will use so-called super-stacking technology to get past 100 3D NAND die layers. We should expect die size reduction and cost-reduction through the use of Nano-Imprint Lithography. The deposition and etching stages in production will have their efficiency improved. It hopes to see two more generations of BiCS flash before changing over to ReRAM (Resistive RAM) technology. One topic the presentation did not touch on was QLC (4bits/cell) NAND and we might wonder if this signifies that the technology is not yet ready for public dissemination. What can we draw from all this? Firstly that we should not think for a moment think Toshiba will exit the disk drive business. Secondly, we can assume WDC shares this NAND vision. Thirdly, Intel/Micron, Samsung and SK Hynix will each have their own plans.